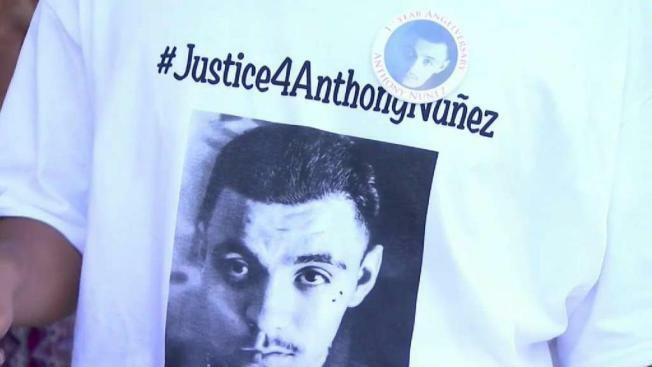 The city of San Jose has been slapped with a wrongful death lawsuit after police fatally shot 18-year-old Anthony Nunez last year on the Fourth of July. Christie Smith reports. The city of San Jose has been slapped with a lawsuit in response to the fatal police shooting of 18-year-old Anthony Nunez last year on the Fourth of July. The lawsuit, which was filed Friday, argues that Nunez was "in the midst of a mental health emergency" when he was shot "without lawful cause or legal justification" by San Jose police. Family members say Nunez was not armed when officers fired the fatal shots, but police previously explained that Nunez emerged from the home with a gun. The ordeal began at a residence when Nunez fired a gun, grazing his head with a bullet in the process, according to the lawsuit. Nunez may have been suicidal, his family said after the shooting. A family member called 911 and was told to take and hide the gun Nunez fired, according to the lawsuit. The family member was able to hide the weapon in the backyard. When police arrived, Nunez proceeded to step in and out of the house "with nothing in his hands and making no furtive gestures that any reasonable officer could construe as threatening," according to the lawsuit. Some time later, Nunez was shot by unidentified police officers. Following the shooting, police said that officers retreated after seeing Nunez carrying a gun. They asked him to drop the weapon, and a member of the crisis intervention team was involved. San Jose Police Chief Eddie Garcia added that Nunez pointed the gun in a "threatening manner" at officers, prompting the shooting. The legal action filed against the South Bay city seeks compensatory and punitive damages. Attorney John Burris and Nunez's family say certain efforts were not met during the encounter. "He was doing great things with his life," Sandy Sanchez, Nunez's mother, said. "He didn't deserve to die. He needed help and that's what [they] should have brought, not guns. They should have brought ambulances and help for him, not guns." San Jose city officials are currently reviewing the lawsuit. They did not offer a comment Saturday. In the meantime, Sanchez is hoping her ordeal never happens to another family. "I want my son back, and what I want to come out of this lawsuit, I want changes to be made so there is not another victim, there is not another Anthony," she said.